Exquisite mermaid gown. Pure elegance and sophistication create a truly stunning & timeless beauty that guarantees to make any bride look absolutely incredible on her special day. Simple elegance from the front meets jaw-dropping sophistication and glam in the back of this full-length mermaid dress. An incredibly intricate low illusion Guipure lace back perfectly balances soft stretch georgette, while a strapless sweetheart neckline keeps the look alluring yet understated. Finished with a crystal button closure and a scalloped tulle and lace train that needs to be seen to be believed. Bought in August 2018 and worn once on my wedding day. The dress comes with a matching floor length veil, included in the price. It is a size 12 but was altered slightly to fit more of a UK size 8/10. Im just over 5’8 and wore heels. The dress has a wrist ribbon & a bustle fitted for the evening. Please enquire if you would like more info, exact measurements or additional photos. 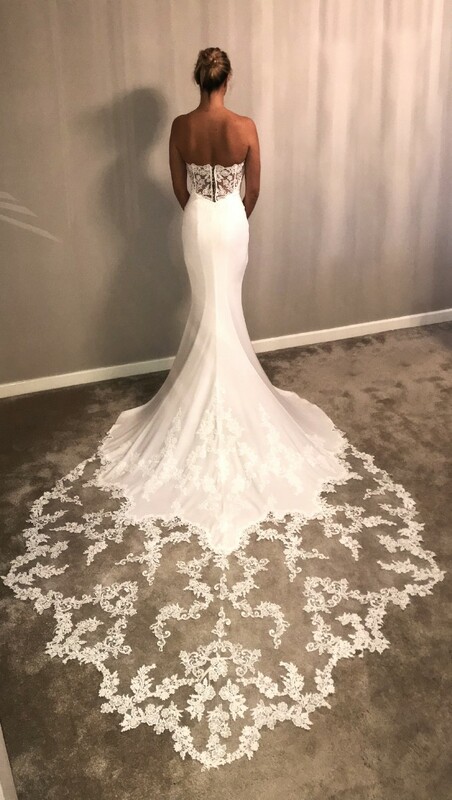 This really is the most incredible dress and it deserves to make another beautiful bride feel just as magical as I did on my wedding day. Once you send a message, Jay can invite you to purchase the dress.